There’s a new trend in town, and it involves running and mountains, a Vancouverite’s dream. As it happens, I love running and mountains. How could this go wrong? Well, it sort of did. But if at first you don’t succeed, they say to try, try again. So I will try again, but first, a little tale of woe. Grouse Mountain hosts Snowshoe drop ins every Monday and Wednesday night, so after hearing several people tell me how amazing it is, you will absolutely love it I believe were the exact words, I took the tram up the mountain to check it out. They had just received a dump of great snow, so despite poor visibility and low temperatures it held the promise of a snowy adventure. I wedged into the dark tram alongside snowboarders and skiers, amazed at people’s stamina after 6 pm, when I’m usually thinking about going to bed. Stifling my yawns at the thought of curling up with a good book, I tried to draw from their energy and enthusiasm as we ascended to the base of my favorite local mountain. After signing in with about seventy other night owls, they split up into groups of varying abilities. Because of high avalanche risk, the back country was closed, which meant the runners would be sticking to Paper Trail. I heard some groans, but it sounded innocent enough. From the word go, the runners were off at a break neck speed down a steep pitch, powder flying up the back of my jacket as I frantically tried to keep pace with fading voices and fainter headlamps. The last time I sprinted downhill was never, so I tried to go as fast as I could without breaking my ankle, or worse, neck, as I navigated between dark forms that I hoped were trees. I managed to barely keep them in sight, when suddenly, several beams of light were coming towards me. The sound of labored breathing – other than my own – was approaching me. Having come to the bottom of the steep pitch, they had abruptly turned and were now trudging back up. Obediently I turned and brought up the tail end of the group as they made their way back up. Someone has to be last, I told myself, as I again tried to keep pace with these jackrabbits. After fifteen minutes of a heart pounding, calf searing climb, I was relieved to see they were taking a breather. I joined their circle as someone yelled “Let’s go!”. I bent over to take a full breath into my lungs, but they were off, screaming down the hill that I had just labored up. Surely, this is a joke. Wondering what was going on, I trailed these inhumane people. Once again, I just caught up to them at the bottom of the hill when they turned and headed up. “How many times do you do this?” I managed to ask between breaths, meaning it took a long time to get out that sentence. 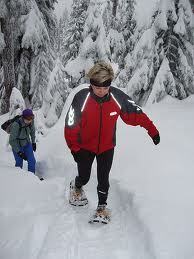 “Four or five,” a snowshoer called over his shoulder. I never did see any of their faces, just clouds of snow as they ran downhill.